In the name of the organizing team, we would like to thank all the speakers, participants and our helping hands for making this event such a big success! Please see the information now available in our Infobox. 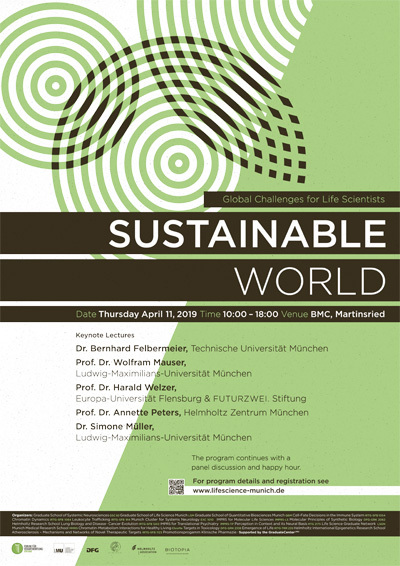 With support from the Forum für Verantwortung the graduate programs of the Life Science Campus Großhadern/Martinsried will address the widereaching topic of sustainability with a campus-wide event. Talks will be presented from experts on different topics related to sustainability, world health issues, environment and climate change, giving our audience also a handle on constructive steps toward achieving sustainability and Global Goals. Online-Registration is closed. There are still a few places available. On-site registration is possible.